Jacqueline Tabbah, Assistant Vice President of International Stoneworks and member of the Marble Institute of America's Women in Stone program is intimately involved in helping her company get found online. 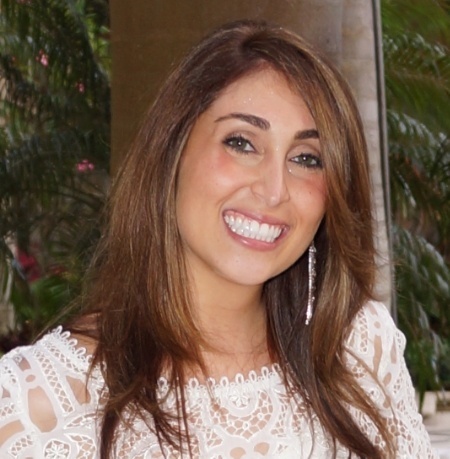 She does so using digital marketing tools and social media, as well as her company business blog. 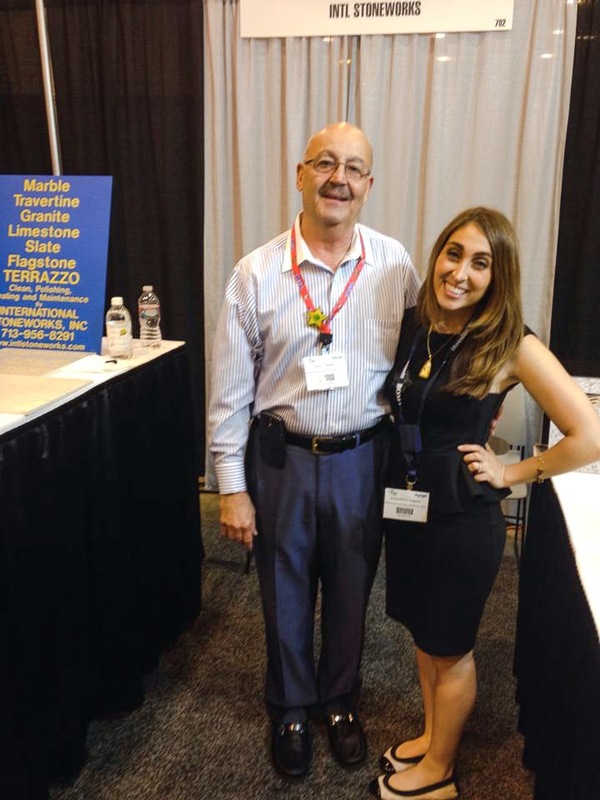 At Coverings 2015, Jacqueline shared with me how effective her blog has been for answering customer questions and helping educate them about stone care and maintenance. Music to my ears given how valuable I consider a business blog to be in the stone and tile industry! In this blog interview, you'll get a firsthand feel for Jacqueline's enthusiasm for and interest in finding new digital ways to reach customers. C.B. : Jacqueline, tell me about your background. How did you come to speak several languages? This explanation is a bit long, so I hope I don’t bore you. My father, Rawi Tabbah and his family were born in Alexandria, Egypt. His parents Henry and Marie Rose later moved to Paris. My maternal grandmother, Gabriella was born in San Vincenzo, Italy, deep in the heart of Tuscany. She later married an Englishman and moved to London where she had my mother, Jane. I like to call my family one big melting pot! French was my second language as I went to a Sacred Heart school, but I always longed to learn Italian. I wanted to communicate with my family in Italy. I sought out a private teacher outside of school and loved every minute of this extracurricular activity. I later wanted to learn Spanish because in Texas it is such an asset. C.B. : Tell me about your company and your role. How did your Dad get started? Rawi started International Stoneworks in 1982 and sold one stone polishing product. The company expanded from there: adding more products and then the stone restoration service division. I feel truly honored that I get to work in a business that my father built from the ground up. I started working for him in 2009, answering phones. My curiosity and passion for stone care and maintenance drove me. After completely re-vamping all online material and creating a social media campaign, I think my dad realized how much I loved the company. Today I am Assistant Vice President. I have a hand in just about all aspects of the business, from estimating jobs to shipping products. C.B. : What are the biggest frustrations your customers have and how do you help them? I think the one phrase I hear the most is, “…but I thought my stone was sealed!” The customers’ frustrations come from not being informed about the proper stone care methods. 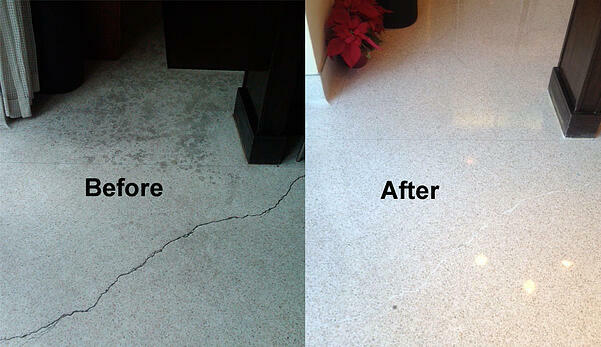 A large part of our business is stone care education, such as: most marbles and travertines react to acids. I helped develop the International Stoneworks App for Windows, which advises customers on the best care and maintenance methods for stone, tile and grout. C.B. : Which stone trends are most relevant for your business? Residentially, a big trend that I am observing is Carrara marble in kitchens and bathrooms. It’s a chance for me to discuss the right stone cleaners and, in time, services to re-hone or re-polish the stone to remove fine scratches and acid etch marks. Commercially, I see textured porcelain tile floors. These floors tend to trap dirt. We use special rotary brushes to scrub clean these tiles and grout lines. C.B. : How does your website support your business? I like to consider our website a resource not only for our customers, but also for those who just want to learn about stone restoration and maintenance. We recommend products, answer frequently asked questions, and display inspiring before and after photos. We are in the process of making our website more mobile friendly, so stay tuned! C.B. : How do you use the Written In Stone blog? I also like to write about how cool stone is, because it really is! Last year, I wrote about the famous limestone Mayan ziggurat, Chichén Itzá (see Limestone: The Building Blocks of Ancient Architecture). I've also written about the sandstone Red Rocks Park and Amphitheatre in Colorado (see Adventures in Stone: Red Rocks Park & Amphitheatre). C.B. : Which social networks are you active on and how do you use them? I try to update Facebook, Twitter (@IntlStoneworks), LinkedIn and Google+ everyday. We also have a few videos up on YouTube and a Houzz account. I love posting tips, before and after pictures and stone care product recommendations. I promote our app and blog on these platforms as well. A picture of the making of our YouTube video. 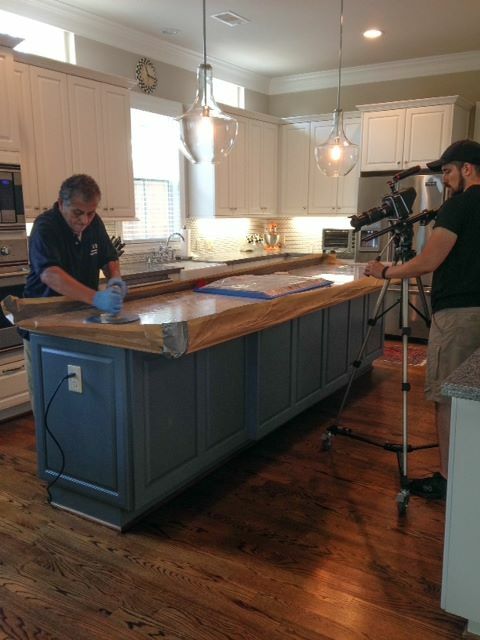 The crew is actually polishing the marble island in my kitchen. C.B. : How did you get started online and socially? When I started at International Stoneworks in 2009, our only online presence was our website. I knew I could improve this area of our business. I immediately created our Facebook page and LinkedIn pages. I was hesitant at first to join Twitter because I wasn’t sure that I would have enough content to post daily. I jumped into the deep end and created @IntlStoneworks, and sure enough, I found that I did in fact have something to say everyday. C.B. : What lessons have you learned along the way? A very important lesson that I have learned about being a woman in a man’s industry is to be the best version of me. I am feminine and there is no hiding that, but I am also professional, courteous, knowledgeable and innovative. I am also incredibly fortunate that I get to work with my dad. His mentorship is invaluable. C.B. : What do you like most about online? I just love writing my blog posts. It’s my little space to share fun stories and advice. I am passionate about stone restoration and maintenance, so it’s an opportunity for me to shine. I also love tweaking our website. With the constant changing of algorithms, it’s a challenge to keep up, but I like challenges! C.B. : You participate in the MIA’s Women in Stone program. What is that? What is your role? How has it helped you? Women In Stone is a professional organization through the Marble Institute of America that provides resources and opportunities to recruit, retain and advance women in the stone industry. I’ve not only met women in a similar profession, but more importantly, I’ve also made real friends who counsel me on how to navigate the stone industry as a woman. I manage the organization’s Instagram account, @WomenInStone. It’s another opportunity for me to get involved and be creative. C.B. : Any parting words of advice for someone wanting to get involved online and in stone? It may sound strange, but just post on your social media accounts, even if you think no one is reading. Be consistent and don’t take it too seriously. It’s your chance to show your personality and the fun side of your business. C.B. : Thanks very much, Jacqueline! What digital tools are you using to help your company get found online? Which ones have you found most successful? If you've launched a blog, what topics have you found resonate best with customers?